For something connected to today's marriage-equality ruling from the US Supreme Court, see yesterday's post. Last week, Lisa and I went for a drive into the USA's biggest industrial park, the Tahoe-Reno Industrial Center, located on USA Parkway off I-80 between Fernley and Reno. Recently, the state of Nevada agreed to buy the USA Parkway from the developer who built the park and to continue it down to US-50. 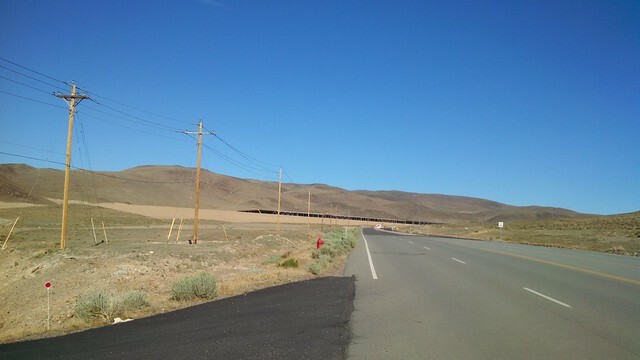 The newly-designated NV-439 will thus form a bypass for traffic between Reno-Sparks and Hawthorne, Tonopah, and Las Vegas. 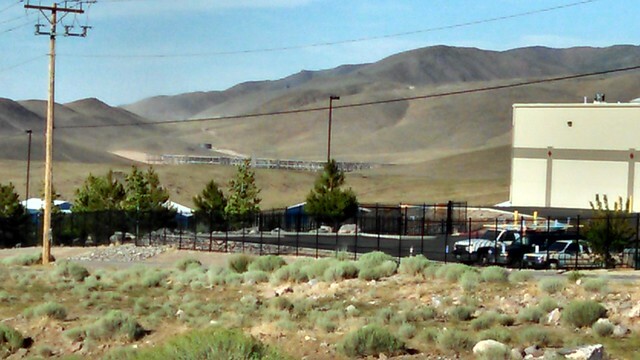 The park is the site of Tesla's "Gigafactory" where they will be making batteries for their cars. This plant is huge, and all of the surrounding cities (including Fernley) are gearing up for the anticipated influx of thousands of workers that will move here when the plant opens. It is, however, difficult to get a good look at the site. Here's one shot of the under-construction factory from the far distance. And this one is from the access road that appears to be the main route into and out of the site. Something that concerns Lisa and me greatly is how all of these people will come and go to work. The industrial park deliberately brags about how there is absolutely no housing in the area, the better to avoid any complaints from nearby residents. The nearest cities of any size are Reno/Sparks to the west and Fernley to the east, about 15 miles each way. There is no public transportation (low taxes means low public services, remember?). Either Tesla is going to have to create their own private bus services like Facebook, Google, etc. have done in the Bay Area, or else the amount of congestion into and out of USA Parkway and on I-80 between Reno/Sparks and Fernley is going to be huge. Complicating things is that while the industrial park is in Storey County (indeed, it takes up most of the northern half of the county) and thus harvests any property tax revenue from the businesses in the park, most of the services impact from new residents are going to be in Washoe County (Reno/Sparks) and Lyon County (Fernley/Silver Springs/Yerrington/Dayton). Don't get me wrong; I'm not opposed to growth. What worries me is unsupported and unsustainable growth.